In a sign of its expanding international influence, Kazakhstan late last year entered into an historic agreement with the European Union, marking the first time a Central Asian nation has formally aligned economically and strategically with Europe to such an extent. The Enhanced Partnership and Cooperation Agreement – signed December 21 during a ceremony in the Kazakh capital of Astana – covers 29 areas of cooperation, ranging from politics to investment, trade, infrastructure, innovation, culture, sports, tourism, law enforcement and more. The large parts of the agreement provisionally entered into effect May 1, with its full entry into force dependent on the ratifications by national parliaments of the 28 EU member states. Astana, capital of Kazakhstan where Kazakhstan and the EU signed their Enhanced Partnership and Cooperation Agreement on Dec. 21. 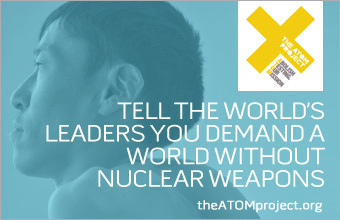 Leaders in Astana and Brussels, where the EU is headquartered, certainly hope so. Kazakh Foreign Minister Erlan Idrissov noted during the signing ceremony that virtually every European ambassador to Kazakhstan was present in the room. Astana, capital of Kazakhstan, where the EU and Kazakhstan signed an enhanced partnership agreement on Dec. 21.
and Kazakhstan strengthens Kazakhstan’s already significant position in Central Asia and reflects the country’s sophisticated, multi-vectored foreign policy strategy. The European Union Council, in a statement released to coincide with the signing of the agreement, has called for strengthening trade and energy links between the EU and Central Asian countries and reinforcing cooperation on security and stability, including sustainable management of natural resources. The statement also stressed the importance of Kazakhstan’s continued democratic development. “It emphasizes the fundamental importance of democratization, respect for human rights and the rule of law, and socio-economic development, all of which are essential elements of the strategy,” the statement said. In many respects, the formal agreement is the natural outgrowth of a long-steady relationship between Kazakhstan and the EU. After all, bilateral trade and economic relations between them have been growing steadily since 2002.The EU has progressively become Kazakhstan’s leading trade partner (eclipsing even neighboring Russia) with an almost 40% share in its total external trade. Kazakhstan’s exports to the EU are heavily dominated by oil and gas, which account for more than 80 percent of the country’s total exports. Exports from the EU are dominated by machinery and transport equipment, as well as products of the manufacturing and chemicals sectors. As of today, more than five thousand joint ventures are underway in Kazakhstan. Imports from Kazakhstan substantially exceed EU exports to Kazakhstan and Kazakhstan’s importance as an oil and gas supplier to the EU also continues to grow, despite sagging prices. Vatanka said the agreement is an outgrowth of Kazakhstan’s ambitious diplomatic agenda. Paul Stronski, an analyst with the Carnegie Endowment for International Peace, maintains that the European Union still has some work to do in determining the best way for its member countries to benefit from the agreement. “The EU still lacks a clear vision for its relationship with Kazakhstan, despite the fact that the EU is Kazakhstan’s largest source of foreign direct investment,” Stronski wrote on the Carnegie website in April. But Stronski also noted that Brussels indicated in July 2015 that it “was reviewing its Central Asia strategy,” and that could lead to a more intensive focus on Central Asia and Kazakhstan. 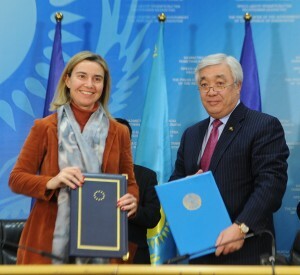 EU High Representative Mogherini (left) with Foreign Minister Idrissov at the Dec. 21 signing of the Enhanced Partnership Agreement between the EU and Kazakhstan. more nuanced approaches to interacting with the five regional countries. The EU will also double the amount it spends on the implementation of this strategy, to one billion euros, over the next five years. Kazakhstan, along with four other countries in Central Asia, were invitied to contribute to the review of the strategy, advocating for more country-specific approaches. y is Kazakhstan one of the most economically EU-oriented but together with Moldova and Azerbaijan it is becoming increasingly so. As mentioned earlier, the EU-Kazakh agreement is wide-ranging, incorporating many different aspects of governance and public policy. Kairat Umarov, Kazakhstan’s ambassador to Washington told EdgeKz that the deal goes well beyond economics. He said counter-terrorism and the fight against international crime are also top priorities. Umarov also said the agreement will give Kazakhstan a chance to showcase its upcoming international specialized EXPO 2017, whose theme is “Future Energy.” The EXPO 2017 Astana is expected to attract more than 5 million visits from more than 100 countries. The expo will showcase energy solutions and innovations to secure a sustainable energy future for all the nations.